The fiber optic connectivity is a communication exchange technology which transfer information through light or optical fiber. The fiber optic connectivity is used for high speed transmission of data. The fiber optics systems enable long distance of transmission of signal with longer intervals of signal transmission. It has larger bandwidth and is light in weight. The fiber optic connectivity also offers high security while transmitting the data. The fiber optic connectivity are used in various industries such as oil & gas, mining, electric substation and wind power. The fiber optic connectivity is expected to an important role in the upcoming years. There is growing bandwidth and in long term communications services. The fiber optic connectivity is also applied in various data centers, telecommunication networks and enterprise networks. The market is witnessing vibrant growth on the account of growing demand for energy efficient solutions across the various industries coupled with low cost associated with the data transfer. This is expected to boost the growth of fiber optic connectivity market during the forecast period. The growing technological advancement in the field of communication technology is also major reason for the growth of fiber optic connectivity market. On the basis of services, it is sub-segmented into professional services and testing services. The hardware is expected to be the leading sub-segment during the forecast period. The high application of fiber optic in the hardware component such as connectors, cables and assemblies is expected to be the major factor driving the growth of the sub-segment during the forecast period. For instance according to International Telecommunication Union, the total number of fixed broadband subscriptions in 2017 was 1,005 million which increased to 1,075 million in 2018. The growing number of fixed broadband subscriptions is expected to increase the application of fiber optic cables which in turn is expected to propel the growth of overall market during the forecast period. On the basis of industry, it is sub-segmented into oil & gas, mining, electric substation and wind power. The growing demand for fiber optics from various industrial sectors is expected to drive the overall fiber optic connectivity market during the forecast period. Additionally, the fiber optic technology is used in submarines and aircrafts. 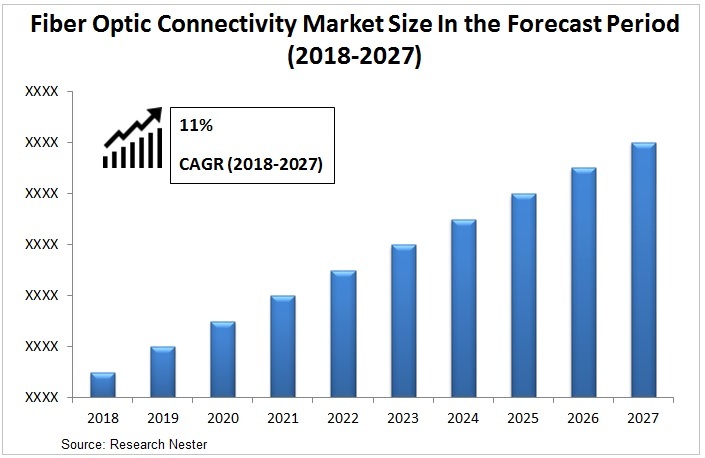 This is expected to drive the growth of fiber optic connectivity market during the forecast period. Moreover, the increasing demand from various industrial sectors is also supporting the fiber optic connectivity market over the forecast period. The increasing technological development coupled with the rising number of data center is increasing the demand for optic connectivity fibers. This is expected to fuel the market growth of the fiber optic connectivity during the forecast period. The increasing technical issues related to fiber optic fiber optic connectivity market is expected to restrain the growth of market during the forecast period. On the basis of regional analysis, global fiber optic connectivity market is segmented into five major regions including North America, Europe, Asia Pacific, Latin America and Middle East & Africa region. Europe is expected to be a leading region for the fiber optic connectivity market during the forecast period. The growth in the fiber optic connectivity market can be attributed to the increasing demand for high data transmission network coupled with high penetration of fiber optic technology in various industries in the region. North America is also expected to witness substantial growth during the forecast period. The growth in the region can be attributed to large number of data center in the region coupled with increasing application fiber optic connectivity in various industries.